When you see these folks at the Waterhole in Forest Park, Queens New York, you might want to say, "Thank You!" Heck, you might even want to consider giving up your prime viewing spot as a way to thank them for the work they did in cleaning and clearing up a path around the waterhole. 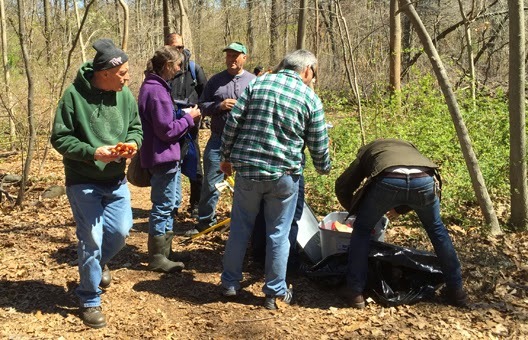 These volunteers took the time out from their busy schedules to participate in a cleanup that was long overdue. 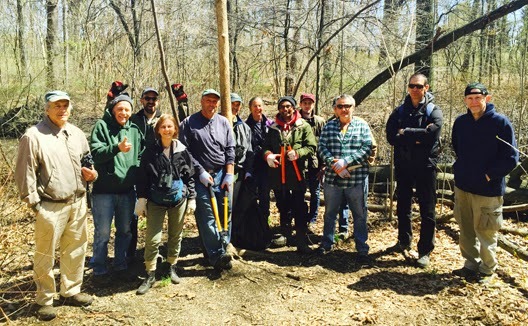 In no order, the volunteers were John Anderson, John Heidecker, Eric Miller, Joe Smulkstis, Gail Benson, Thomas Burke, Jeffery Paris, Steve Walter, Frank Donovan, Daniel Melore, Robert Veltri, Jean Loscalzo and Wendy Armenio. Nicole Gamory and Josephine Scalia from Parks who were there to supervise the project were supportive of the event and instrumental in getting us tools. For those of you not familiar with the Waterhole, it is one of several vernal pools (also called ephemeral pools, are temporary pools of water that provide habitat for distinctive plants and animals.) in Forest Park Queens. This one has the distinction of being a magnet that attracts hordes of migrating birds. On a good spring migration day, birders and photographers can be seen in great numbers as they eagerly wait to get looks and photos of those colorful birds that sends hearts a flutter. Even then, it was hard like it usually is to get anyone to participate in these events. It seems either the dates are always wrong or people just don't see cleaning up around the places they bird and take photos at as a priority. I suspect that it is a bit of both. The latter is one of frustration for me because I think this is where many in the birding/photography community lose the plot. We cannot expect to get things done if we don't step up and be a part of the changes that are needed. But I digress and enough of my ranting--I'll save that for another day. 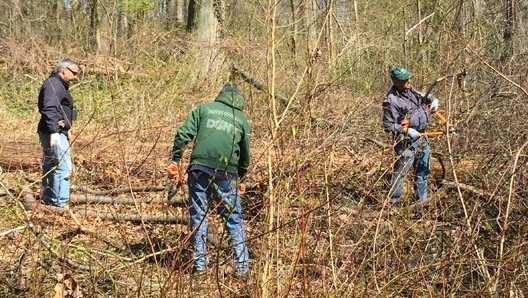 The volunteers who showed up for this event are to be commended as they worked with the few tools that were provided. I say "few" because all we had were a few loppers and hand saws. No power tools or rakes were involved. 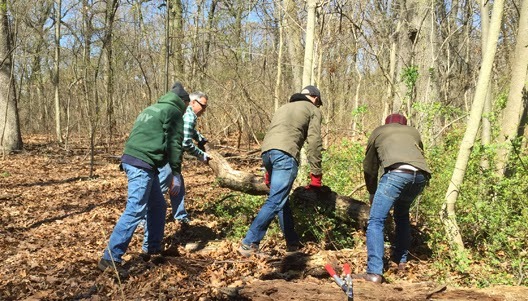 Nevertheless, this group of determined volunteers did an excellent job of cleaning up, cutting and removing several fallen trees and ended up clearing a path around the waterhole. It looked a lot better when we wrapped up the project and everyone was filled with pride as they surveyed the work that was done. Never underestimate a group of determined people, we got the job done!